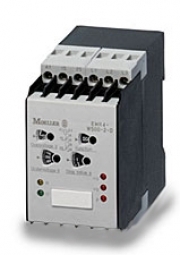 Measuring and monitoring relays are required for the most varied range of applications. EMR4 range measuring and monitoring relays cover a wide range of applications: Current monitors for universal use, phase monitors for monitoring destruction/damage protection for individual system sections, phase sequence relays monitoring the rotating field, unbalance relays for reliable phase loss detection, multifunctional three-phase monitors, asymmetric phase monitoring relays in a single device, level monitoring relays for monitoring fill levels and earthleakage monitors for enhanced operational safety. All relays are devices for world markets to IEC/EN 60947 and UL/CSA approval. Many relays feature multi-voltage coils. This simplifies stock keeping and enhances the flexibility when reacting to customer requirements. The EMR4-I current monitors are suitable for both AC and DC monitoring tasks. The selectable lower or upper tripping limit means that they can be used for the underload or overload monitoring of pumps and drilling machines. They are available in two versions, each with three measuring ranges (30/100/1000 mA, 1.5/5/15 A). 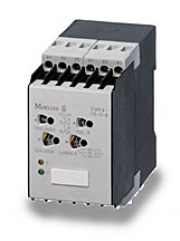 The multi-voltage coil allows these relays to be used for a wide range of applications. The second changeover contact is provided for direct status indication. The on-delay can be selected between 0.05 s – 30 s in order to bridge transitory current peaks.